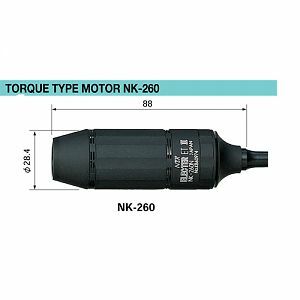 This NSK motor is an excellent combination of high speed and high torque. It is perfect for applications requiring large burs. • High performance samarium cobalt magnet. • High accuracy, lightweight, compact, high reliability and superior durability. • The life of the carbon brushes is about three times greater than conventional motors. • Major reduction of RF noise. • Provides extremely quiet operation form low to high speed and stepless speed adjustment. • Weight (w/o Cord): 5.15 oz.